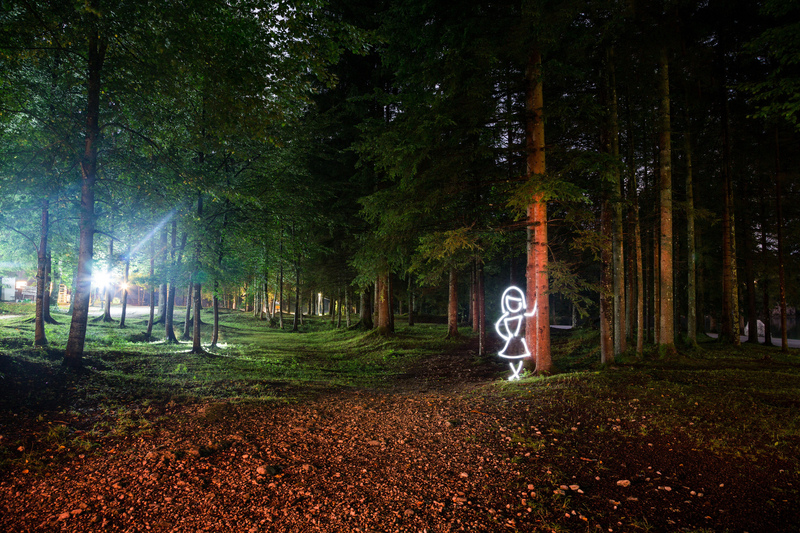 This is another from my Slovenia lightpaintings. Everything is done in camera, drawing the lines with a flashlight/torch. I use a tiny baby’s sock as a diffuser on the flashlight to control flare and keep the lines clean. One challenge I hadn’t anticipated before this trip was the way the light spill from the diffuser could catch your clothing. Normally I light paint in dark clothing as a precaution, but there’s a whole series of shots in Slovenia which I shot in Bermuda shorts. This is one of them, and the red/white shorts are just visible. There are other one’s which are potentially ruined – so beware if you try this out! I’ll be back in dark clothing next time. In terms of controlling the movement of the torch, I always measure out the figure against my own body. So her face tracks the edge of my face, etc. It works well to minimise retakes due to crossed lines or odd scaling, but it does keep the light close to you, exacerbating the issue with spill from the diffuser outlined above. You’ll see little ghosts of me behind some of the trees on the left too, trying to hide behind the trees as I added some low level backlight. The foreground and trees are painting in with strokes of a flashlight through an amber gel. I thought that would give some interesting contrast with the turquoise glare of the campground. In the background there’s a road – I have others from this location with passing cars, but thought it was stronger without the distraction. There were a handful of road signs back there, all cloned out along with a few leaves way up at the top of the frame. There’s no tweaks of any sort to the light painting. There’s some incredible fog around today. I wish I could just take a day’s holiday to get out into it with a camera, but it’s quarter end. That’s made catching up with people a little slow – apologies if your one of those I’m behind with. Look forward to seeing your pictures today.